Do you have students who say they don’t like to write or those who say they don’t know what to write about? Watch pencils fly across their papers when they’re given my 260 prompts that be used for daily journal writing or to encourage class discussions. Suggestions of how to use them are included. Great for morning meetings and centers! Take a look at the comments teachers have made about my prompts and you’ll understand why they’ve been downloaded thousands of times! 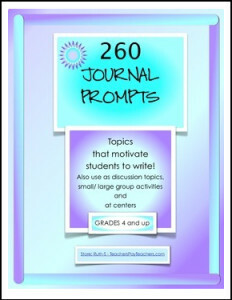 IMPORTANT If you’ve downloaded my prompts previously, this is a new packet of 270 prompts! New prompts have been added and more! There is also a new cover for the packet that has “270” on it even though 260 still appears. These prompts are being used by elementary, middle and secondary teachers (up to 10th grade). Secondary teachers have mentioned that they use them with certain groups of students who just don’t like to write and or who have difficulty writing even the first sentence of a response. Whatever the case, there are many various ways to use them and now with over 130,000 downloads I’m REALLY HAPPY!! 🙂 Why? Because I know what it’s like to have journal prompts that students don’t relate to! If you’d like to see more of my resources, please follow me by clicking on the star near my name. You’ll receive FREE updates for any of my resources you purchase. I’ll send you a note in your Teachers Pay Teachers inbox to let you know that I’ve updated a resource so you can download it again FREE of charge. For that reason, always check your Teachers Pay Teachers inbox. Leave me a comment about how you use these cards or tell me the grade level you teach. I LOVE comments! Comments earn YOU TpT credits! If teammates, coworkers or a school or a school district would like to use my resources, there is a multiple user license that is available at a reduced price. All rights reserved by author. Ruth S.
This resource has a single user license and is to be used only by the purchaser. Permission to copy, for single classroom use only. I’m a teacher/author and offer Language Arts, Science, Social Studies, American History, Novel Packets, Grammar, Back to School, Holidays, Writing, Poetry, Spelling, Teacher forms products and more! Take a stroll over to my blog, Teacher Park, where you’ll find more teaching ideas resources, products and freebies. I’ve posted many teaching tips, resources, Common Core resources, brain breaks, teacher blogs, technology tip websites, behavior management and interesting classroom ideas, on my Pinterest boards. It’s a lot of fun sharing them with other teachers! The following are just some of the resources I offer on Teachers Pay Teachers. To find more, look for CUSTOM CATEGORIES on my store pages and select a subject. Novel Response Cards Use with any book or story. This is one of my most popular resources! Number the Stars 19 Page Packet This is now a 70 page packet. An informational article about World War II for pre reading, activities, was added with questions and answers. Also included are maps of Europe and Denmark with questions and answers. Similes Metaphors and More Use with any book or story! Examples and definitions are given on each page. Figurative Language Chart and Student Worksheets A very handy reference chart with examples of figurative language as well as other activities. Students use their copies of the chart as they work on written assignments in class. . A VERY popular resource all teachers must have! Design a Game Book Report An amazing book report. Students create games based on stories they’ve read. All time favorite activity with my students and their parents! Be sure to have a game day! Bloom Ball Reports Inspires students to “think out of the box” to create reports for any subject, book, or story. Based on the latest verbiage of Bloom’s Taxonomy. Students, teachers and parents LOVE these reports! The following resources can be used with any book or story! Nonfiction Bingo A great way for students to become very familiar with nonfiction features. Nonfiction Find It and Check It This packet helps to reinforce nonfiction text. Common Core Informational Text Article (Cheetah) FREE! Brians Winter Student Worksheets Gary Paulsen’s survival books keep students on the edges of their seats! Fairy Tales Worksheet PacketFun! Imagine Cinderella’s glass slipper is a sneaker and she arrives to the ball in a limo. Students love these activities! Frindle Literature Guide 87 pages. Includes an informational article about the Bill of Rights and Freedom of Speech with questions and answers. Is freedom of speech different in the classroom than what is says in the Constitution? Maniac Magee Fortunate and Unfortunate Events If you purchased my Maniac Magee packet, please do no purchase this. It is in the packet. Who doesn’t love a contest? You’ll notice that even your most reluctant readers will join in this weekly fun! See the links for more details. Parts of Speech Animal Theme Posters Laminate for future use! How to Spell Plural Nouns FREE! Idioms are Fun Packet Have a frog in your throat? Students don’t seem to know what common idioms mean. They’ll have fun discussing the literal and true meanings of them. Writing and Journal Prompt Task Cards Topics students relate to!! Movie Review for StudentsKeep your students focused as they watch videos in class. Add these sheets to your sub folder! Education Quotation Posters Student Activity FREE! Inspire your students to think about education and learning by displaying these 8 1/2 inch by 11 inch posters year round. A perfect monthly writing activity. Students discuss the meanings of the quotations and write their interpretations. United States Reports Travel Agent Edition Students role play as travel agents as they research the U.S states. Moon Exploration Activities Students create a moon exploration time line. Math is integrated. Isaac Newton Laws of Motion Activities students relate to! Inventors Research Project Extensive list of inventors. accompanies this research project! Ireland Mini Report for St. Patricks Day FREE! Thanksgiving Activity Five Kernels of Corn A true story about the Pilgrims starving time when they had only fiver kernels of corn to eat each day. Thanksgiving Word Art Poster FREE! Valentine’s Day Fun Alphabet Cards FREE! New Year Resolutions Mine My Town My Country The World School is included in this packet. Students think “out of the box” to write the resolutions. North Pole Headline News Students have fun writing news articles about the North Pole. Examples of headlines are: Santa Loses His Cell Phone, Santa Buys an iPad, Rudolph’s Nose Turns Blue and many more! Fun! North Pole Prepositions FREE! Fun!! You’ll love your students’ illustrations of the sentences with prepositions! Veterans Day An inspiring project that’s loved by students, parents and teachers! Langston Hughes Dreams FREE! A fantastic resource to encourage your students to follow their dreams. Use during Black History Month, to celebrate Martin Luther King’s birthday or add it to your poetry unit! These activities can be hands on cut and paste activities or students can write their answers on the snowballs.